Underfloor heating operates at a lower temperature than a conventional water heating system, meaning the cost of operating is reduced in comparison to a conventional water heating system (such as radiators). Studies have shown that a human is at optimum comfort when feet are warm and air around the head is cool. Underfloor heating only emits its primary heat to around 3 foot, making this the most favored method of heating. Unlike that of a radiator system, which emits heat from 3 foot and causes a pocket of warm air at head height, the total opposit of what the body desires. As underfloor heating is hidden below your floor finish, there are no heating components such as radiators blocking an area you may want to put an item of furniture. Your room will be a blank canvas! With the use of high quality thermostats, you may separately control each zone throughout your home or business. You can separately control what time each underfloor heating zone is activated and to what temperature it will operate at. Accepted file types: jpg, jpeg, gif, tiff, png, pdf, dwg, svg, dxf. If you have floor plans, please feel free to upload. This will allow us to measure and quote more accurately. Solid floor underfloor heating systems include all floor constructions that have underfloor heating pipework embedded in concrete or screed. They include concrete structural floors and concrete screed floors, as well as block and beam floors with a screed finish. The screed or concrete act as the heat dispersion medium and contribute to the overall efficiency of the system, meaning it works very well with setback time control. •	Screed – either a sand/cement screed (65mm/75mm minimum) or flowing anhydrite screed (50mm minimum). There are other proprietary screeds available with different drying properties, strengths and minimum tolerances. This system is the most common type found in new build projects from domestic to commercial, schools to care homes. It has the greatest floor height build and therefore must be planned in at the early stages of the project. 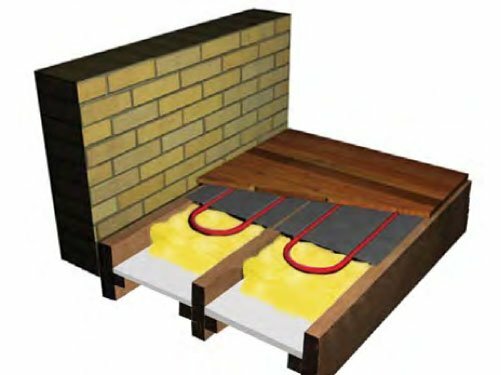 Underfloor heating may be successfully installed within a wooden suspended floor. It is essential that planning begins at an early stage in the project to ensure the floor build up and design can be accommodated, as there may be a requirement to notch out joists. This system can be installed either between the joists or in between cross battens which are laid onto wooden boards which overlay the joists. Both systems use aluminium diffusion plates to increase heat dispersal evenly across the floor. It is necessary to insulate between the joists to prevent downward heat loss. In some cases a biscuit screed can be used instead of aluminium diffusion plates. 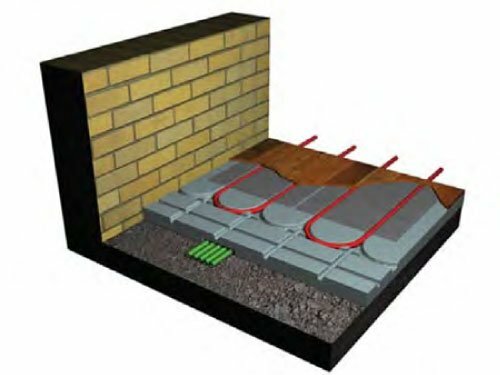 Suspended floors have a limited output compared to the solid floor screed systems, although this output should be more than enough heat for modern well insulated buildings. Floating floors reduce the overall loading within a building, reducing the weight of the floor compared to other floor systems. This system uses insulation panels which are pre-grooved at 200mm centres and into which are inserted aluminium diffusion plates. The insulation panels are produced in a range of thickness from 30mm-100mm to suit the floor build up. Some of the benefits of this system include speed of installation, floor components are fitted at first-fix stage, and floor coverings can be fitted immediately. You do need to install a minimum of 18mm chipboard on top. For retrofit installations you can use an overlay system of pre-grooved cement boards which click into place with each other. These are 18mm thick and are ready to either receive a tiled floor covering directly or have a levelling compound applied before installation of other floor coverings such as vinyl or carpet. 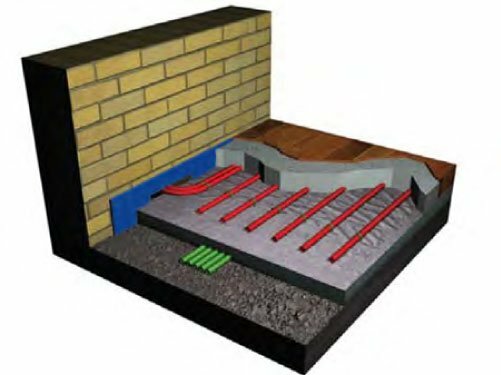 We recognise that there are endless possibilities and options when it comes to installing a wet underfloor system and the above schematics illustrate broadly the systems available. It is important that you call our team with your specific floor requirements so that we can design you a system that is right for your needs.